posturing, violence and drug taking of the milieu in which he must survive. Even the chocolate bar that you choose is a minefield in this world of subtle and not so subtle rules and power play. Jaylon really wants to buy a Milky Way (‘A bar that takes me back to a time when life was simple, easy…a time when I could eat whatever chocolate bar I wanted.’) Other possible bars are either ‘too pikey’, or ‘too girlie’, or ‘too much to prove’ so it has to be a Galaxy - ‘a good choice. It shows a certain class, like a man’s got taste’. Thus, the feeling of control, of freedom that the gang appeared to offer when Jaylon joined aged 12, is revealed as a terrible con since ‘once you’re in there’s no out’. Abandoned by his father and at the end of her tether, Jaylon’s depressed mother has sent him to live with his aunt Marsha, a fervent Christian whose flat is filled with religious iconography including a hologram of Jesus. From one side it shows ‘a smiling Jesus in robes, clean beard and hair; from the other ‘it’s a Jesus with a crown of thorns, bare shoulders, all bloodied and messy, his eyes rolled back in his head, mouth open.’ Jaylon’s ritual is to stand in front of the Jesus hologram and get it to change. ‘Life/death, life/death…’ – a powerful metaphor for the choices, both literal and internal, that he has to make. One of the most telling moments in this powerful novel is at a dog fight when the gang leader’s defeated pit bull Sugar Ray, is dying from his injuries. Jaylon realises: ‘I’ve never seen anything look as scared in my life. It’s as if all the energy, all the violence that’s been bred into him his whole life has been drained and he’s just left confused and suffering.’ When the gang leader Shads tells Jaylon to shoot the dog, he does but something has shifted for him – the beginnings of a rebellion that will lead him to make his own choices. 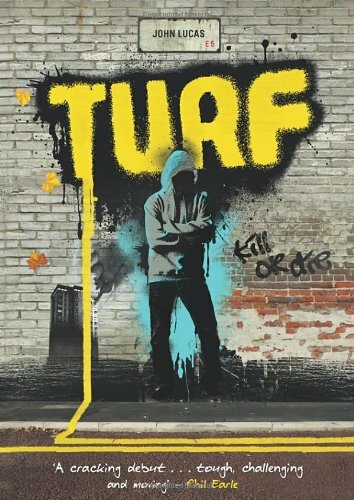 Turf is an unsettling read with its no holds barred depiction of the misogyny and violence of teen gang members. An exceptionally powerful debut novel; John Lucas is a writer to watch.